Banbridge Cycling Club attended a "Safer Cycling Project” event at ABC council offices, Armagh on Monday 15th April. The event was organised by Cycling Ulster along with ABC council, local policing and Community Safety Partnership team and was attended by 15 cycling clubs from the ABC council area. Cycling Ulster has secured resources to support all 15 cycling clubs with recording cameras and Hi-vis gilets. Each club was presented with two cycling cameras one front and one rear and two hi-vis gilets with "we use CCTV" on the rear. There were a number of speakers in attendance including Cycling Ulster Chairman, Tommy McCague, Patricia Gibson from Armagh, Banbridge and Craigavon PCSP, Inspector Brian Mills, Lisa Sherman PSNI Crime Prevention Officer, Inspector Rosemary Leech from the PSNI Roads Unit, Billy Stewart PSCP Project Officer and Gary Lavery Cycling Ireland Membership Development Officer. 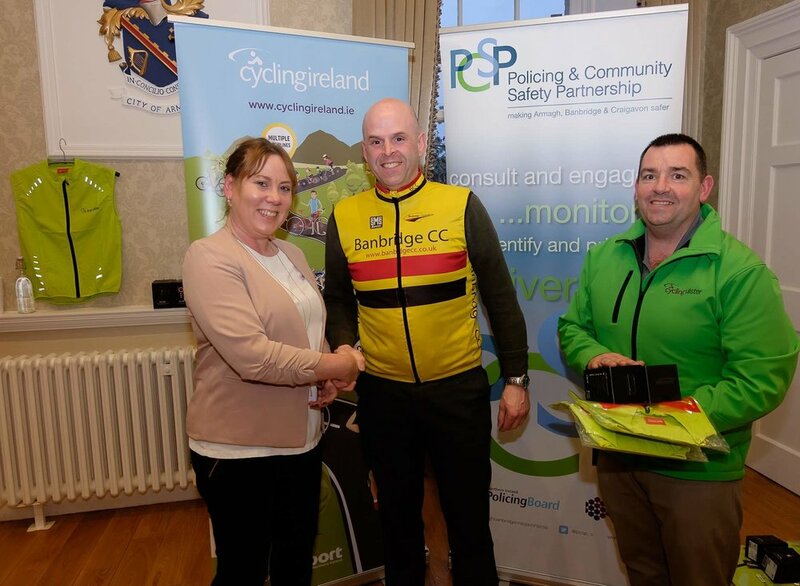 Cathy Donnelly PCSP Vice Chair and Cycling Ulster Chairman Tommy McCague can be seen below presenting Banbridge Cycling Club with their camera and gilets.